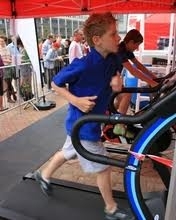 Project summary: The project provided opportunities for members of the public to ‘try’ the sport of triathlon (i.e. 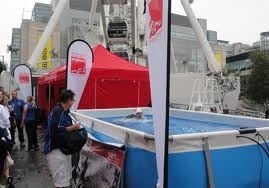 swim, cycle, run) free of charge during the London 2012 Olympic Games period. Location: The 2012 Triathlon Live sites were situated within 8 cities – Bristol, Cardiff, Coventry, Edinburgh, Leeds, Leicester, London and Manchester. Programme: The facilities included an Endless Pool - to swim against a current, fixed bikes for cycling and treadmills for running. The Live sites were used to promote the sport of Triathlon and promote interest in the Triathlon events at the 2012 Olympics. Usage was predominantly on a casual ‘come and try’ basis by members of the public but some slots were booked by Triathlon clubs for training purposes. Initiator: International Triathlon Union and the British Triathlon Federation working in conjunction with LOCOG, the BBC and local authorities. (Plus Endless Pools provided the state-of-the-art pools for the project) Project Duration: Sites were provided for 4 day periods (4-7 August 2012) with the exception of the site in Hyde Park which was in place for 3 weeks (28 July – 12 Aug). 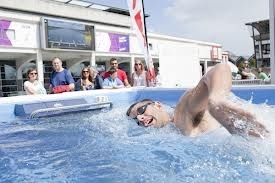 The Triathlon Live sites had previously been trialled by England Triathlon across 4 sites in 2011. Lead in Time: 1 day set up/1 day take down Site Area: The facilities were provided within a compact area, no bigger than half a tennis court (circa 12m x5m). Client Team: LOCOG / relevant local authorities / Wattbike / Endless pool Project Team: Led by England Triathlon, sites were run by one member of staff from England Triathlon and about five volunteers per site. Funding Sources: England Triathlon £13k Funding Type: internal budgets Project Costs (Build): Labour (volunteers) £ N/A, Equipment n/a The equipment was provided free of charge during the Olympics period by England Triathlon and Endless Pools. Purchase price per unit comprise around £22k for Endless Pool, £1-4k for treadmills and £1-2.5k for bikes. Project Costs (Operation): Water/Power: £13k, Staffing: 1 paid, volunteers Profitability/Loss: N/A - The sites were used for marketing/promotion purposes, to promote the sport of Triathlon and Endless Pools. Permissions / Permits: Dependent on location/local authority – there were planning conditions at some sites relating to noise/lighting etc. Local Links: Links to London 2012 Olympics and related events. 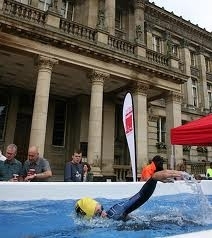 Also promotion of opportunities to take part in triathlon events/clubs within the relevant local areas. Publicity/advertising: Website, local advertising.